Larousse Gastronomique (page 598) defines a lamington as ‘a small Australian cake, made from a square of sponge coated in chocolate icing and dipped in dessicated coconut‘ (abbreviated). The cakes are named after Lord Lamington who was the governor of Queensland from 1896-1901. The idea is to soak sponge in a chocolate sauce and then leave that to set, before dusting with dessicated coconut to make it easy to eat. As Dave does not like coconut I have never bought these as a treat, nor made them. However when Marcellina set us the task of making lamingtons for the Daring Bakers’ challenge this month and allowed us to make them using any flavouring and topping we wanted to, I decided to go with what Dave loves. On our last day in Paris, Dave and I went for ice cream. My last ice cream treat will always be a split cup of hazelnut (my favourite choice) and something new. That way, if the something new disappoints at least I have my favourite to end with. Dave always has his favourites and on that day he had chocolate, raspberry and pistachio. So I made a Genoese sponge (recipe adapted from Larousse Gastronomique page 494) and replaced some of the flour with cocoa powder to make a chocolate cake, which I then coated with raspberry curd. The recipe for the curd has been adapted with permission from Lorraine and it made a runnier curd than what my recipe makes. I then sprinkled on pistachio nuts and presented Dave with his treat. He told me that the raspberry comes through and that the nuts offer texture. To me, that is the perfect dessert and I hope if you don’t like traditional lamingtons you will give the ones I have made a go. Wow Tandy, I love the way your dessert turned out my husband would of loved this. Printing for later….Thanks! What a delicious variation on lamingtons, Tandy! Pistachios are so delicious and I can imagine that they sit well as a coating on these little cakes. Interesting that you use fructose. 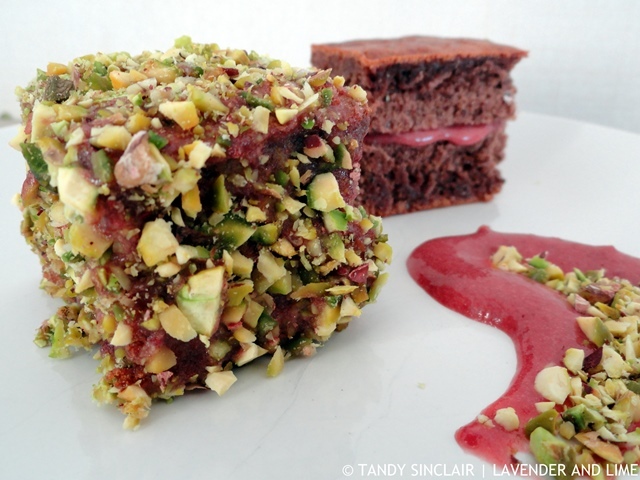 NZer’s love lamingtons too and I love your twist on them – Tandy.